Everyone deserves a night out with their friends — but sometimes, playing the hostess can be exhausting. Have you been searching for the perfect way to pamper yourself, treat your friends AND enjoy the night? Well, we have the exact experience you have been looking for. 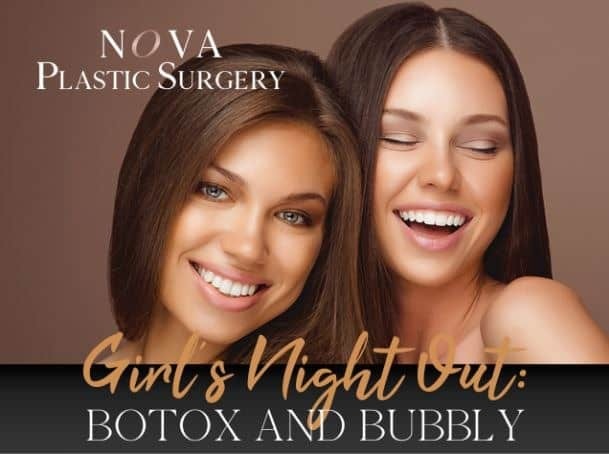 Now, you can host a Nova Botox Party for yourself and five friends, without any of the hassles that come along with throwing a get together at your own place! You (the hostess) get to invite five of your friends who are new to our practice. Our parties are designed to be personal and intimate, giving you time to connect with your friends while pampering yourself at the same time. The 2-hour event will take place right in our office, where light refreshments will be served. Free consultations with qualified staff members also will be available. Everyone receives Nova Botox treatments. This is the perfect pick-me-up, and everyone leaves feeling pampered, refreshed and looking like the best version of themselves. All party guests can purchase other treatments or products. All party guests receive 5% off any product or services they pay for that day.Everyone walks away with a swag bag filled with amazing goodies! This is designed to be a relaxed, fun night out for your and your friends. As the hostess, not only will you benefit from the camaraderie of the evening and the expert treatments, but there’s an extra bonus available for you as well! You will receive a 5% credit from the total purchases made during the event. For example, if your guests paid for $5,000 in products and services, you will get a $250 credit to use toward your next appointment. It’s a night out with benefits! There’s never been a better way to get everyone together and have a night of carefree fun — and everything is designed with you in mind. Don’t let this opportunity pass you by. Contact us today to schedule your Nova Botox Party!